3x Detox Max - Natural dermocosmetics and dietary supplements. Collagen creams. 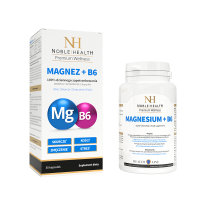 It supports detoxification process of the body and proper functioning of the digestive system. Detoxification of the entire body in just 7 days! 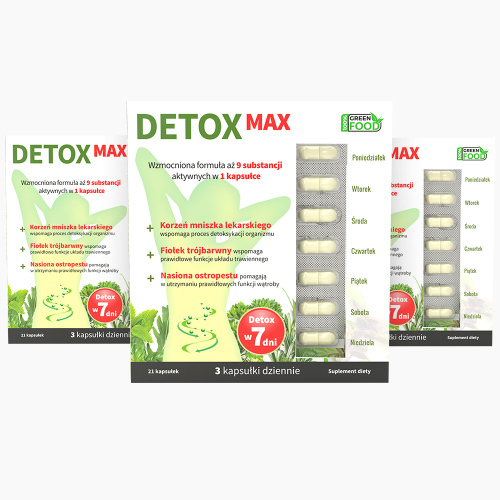 Detox Max is a product for those who wish to cleanse the body of excess toxins. Dandelion root supports detoxification process of the body as well as digestive functions. In addition, it has a beneficial effect on the liver and functioning of the urinary system (kidneys). Viola Tricolor supports proper functioning of the digestive system. Milk thistle seeds aid in maintaining proper functions of the liver responsible for digestive processes and body cleansing (detoxification functions). Aloe Vera helps to remove by-products of metabolism out of the system and has a detoxifying effect. Nettle supports renal functions of kidneys. Prunes – contain pectins which cleanse the body of excess toxins. Fiber – facilitates functioning of the digestive system. Synergy of ingredients to ensure proper cleansing of your body. 1. Who is Detox Max designed for? 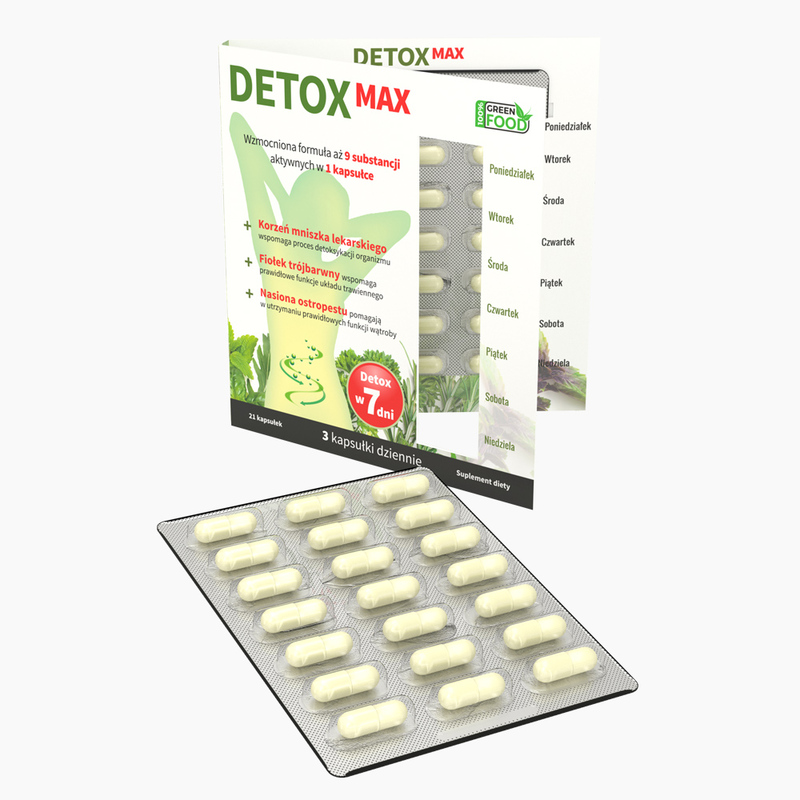 Detox Max is a dietary supplement designed for those who wish to cleanse the body of toxins. 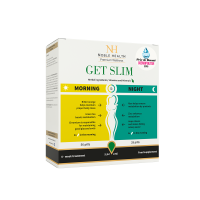 The product contains natural ingredients which support detoxification process of the body (milk thistle seeds) and contribute to proper functioning of the digestive system (Viola Tricolor) and kidneys (dandelion). 2. What’s the composition of Detox Max? 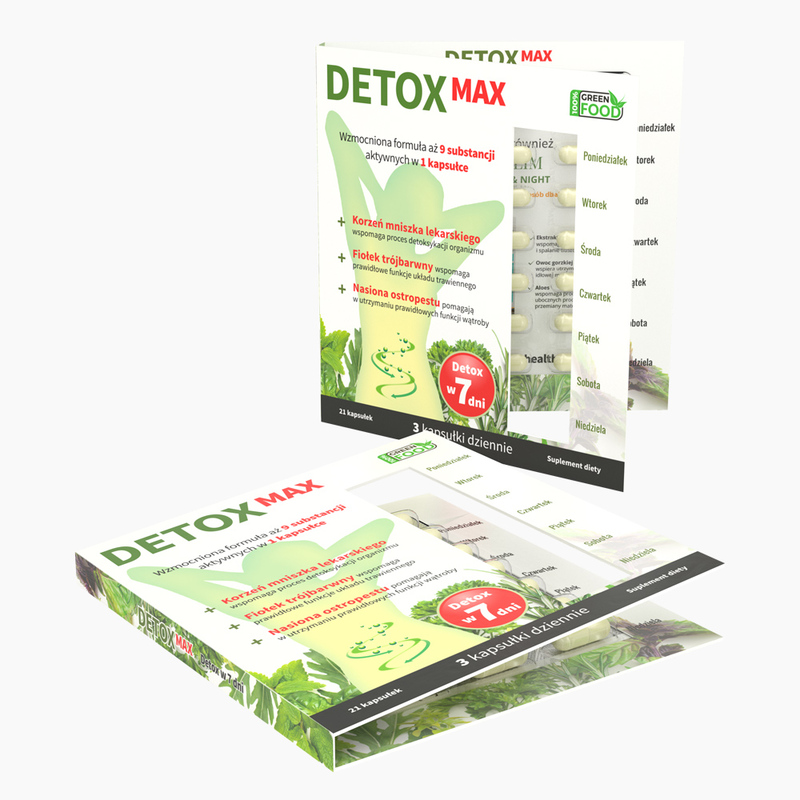 Detox Max has the following composition: hydroxypropylmethylcellulose – capsule, powdered Aloe Vera juice (Aloe Barbadensis), powdered prunes (Vatica mangachapoi Blanco), oat fiber (Avena Sativa L.), barley fiber (Hordeum vulgare Linn), apple fiber (Malus pumila Mill. ), dandelion root extract (Taraxacum officinale), common nettle extract (Urtica dioica), Viola Tricolor extract (Viola tricolor), milk thistle seed extract (Silybum marianum), distilled water – capsule content, potato starch, anti-caking agents: silicon dioxide, magnesium salts of fatty acids, dye – titanium oxide. 3. What’s the effect of the ingredients of Detox Max? Detox Max contains dandelion root which supports detoxification process of the body as well as digestive functions. In addition, it has a beneficial effect on the liver and functioning of the urinary system (kidneys). Viola Tricolor supports proper functioning of the digestive system. Milk thistle seeds aid in maintaining proper functions of the liver responsible for digestive processes and body cleansing (detoxification functions). Aloe Vera helps to remove by-products of metabolism out of the system and has a detoxifying effect. Nettle supports renal function of kidneys. Prunes contain pectins which help to cleanse the body of excess toxins. Fiber facilitates functioning of the digestive system. 4. 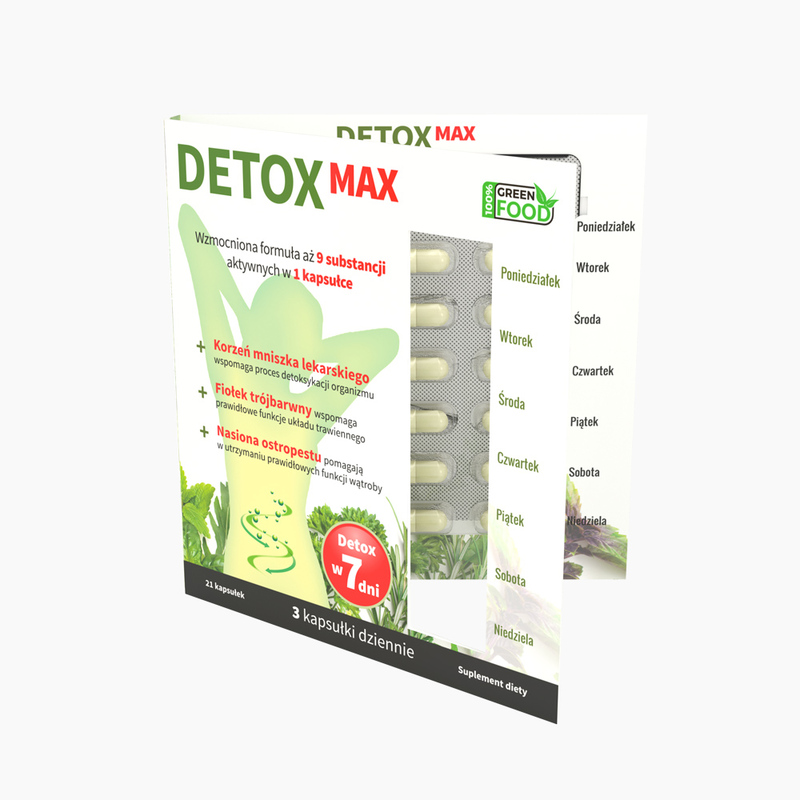 How to use Detox Max? 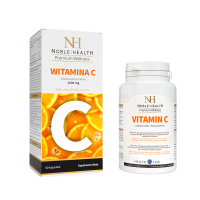 Take 3 capsules a day, preferably in the morning with a sufficient amount of water. Do not exceed the recommended daily dosage. Dietary supplements should not be taken as a substitute for a varied diet. A balanced way of nutrition and healthy lifestyle are key in keeping you healthy. A recommended daily dosage ensures beneficial effect on health. 5. How to store Detox Max? Detox Max should be stored at a room temperature in a dry place, out of reach of small children. 6. 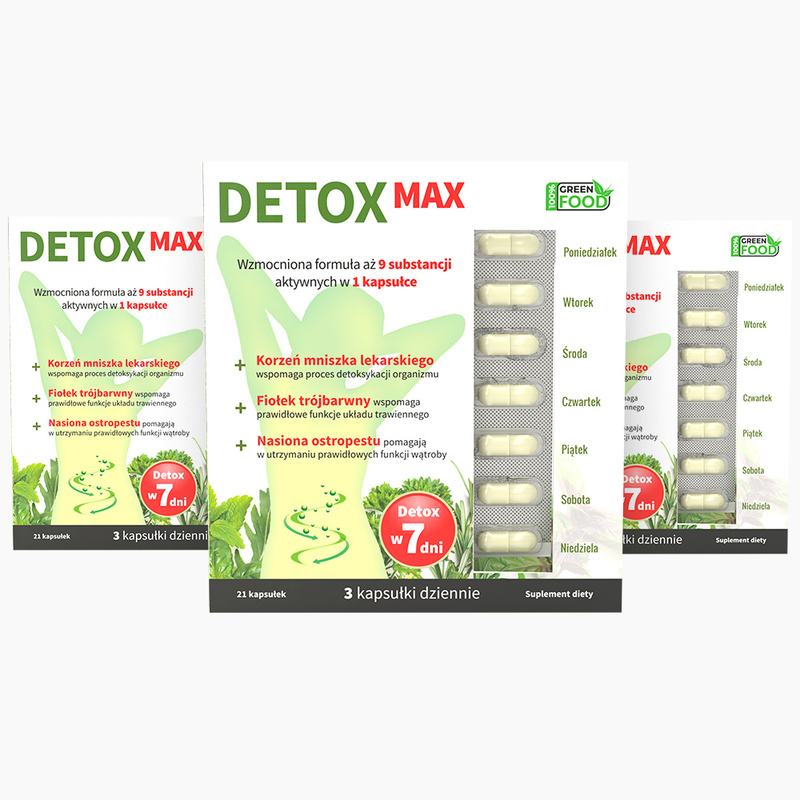 How many capsules does a package of Detox Max contain? 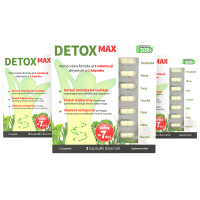 One package of Detox Max contains as many as 21 capsules, enough for a 7-day detoxification of the entire body. 7. What’s a net weight of Detox Max? It works! Very good product, effects can be seen after a few days! It's already working well and this is only first two doses that I took by now!